I’ve just been seized with the desire to update my blog for the first time in months, and I thought I’d better take advantage of it before the moment passes! Life has changed tremendously for Dayne and myself. After months of fertility testing for a conclusive diagnosis of what was wrong with me (everything with hubby is fine), we finally said “see ya later” to the fertility doctor and decided to try to get pregnant naturally. We were trying to trust the Lord (key word: “trying”) that if He wanted us to have children, we would one day… and if He didn’t, we wouldn’t. This wasn’t as easy for me to accept as it was to tell myself. Our plan was to go back to the fertility doctor in 3 months if nothing happened. 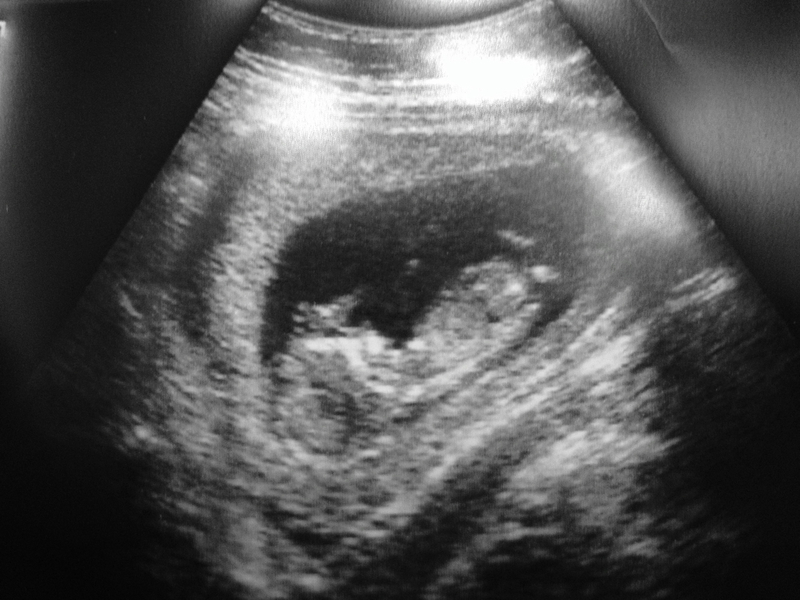 Our biggest hope, though, was to get pregnant without the doctor’s help. We didn’t feel this was necessarily an obtainable goal, given the evidence that I don’t usually ovulate on my own. After all the diagnostic testing with the reproductive endocrinologist, I was diagnosed with “mild” PCOS: although my glucose, insulin, and male hormone levels were all normal, my body wasn’t naturally producing enough progesterone and estrogen for my cycle to complete. Anyway, during that first month away from the doctor, I busied myself adjusting my lifestyle: I had gone to a PCOS nutritionist who advised me to eat as many whole, natural, organic foods as I could, avoid as much sugar as I could, and switch to full-fat dairy (including Greek yogurt for added protein). I was dutifully shopping at Wegman’s and actually using an app called Shopwell (www.shopwell.com) to decode food labels. Hubby & I also invested in an elliptical, which I figured was not only better for my joints than a treadmill, but would be safe and low-impact for me to continue while pregnant. I really disciplined myself to use that elliptical, which surprised both Dayne AND myself. I was determined to correct my PCOS naturally as much as I could. We were really trusting God during that time. I can’t say I wasn’t emotional about it and didn’t have a difficult time doing it, but I really wanted to give God the space to work since we’d been going to doctors and trusting them for almost a year. To make a long story (and a lot of tears and a wasted pregnancy test) short, somehow I got pregnant during that first month. We were both in shock when we saw the pregnancy test with “Pregnant” clearly emblazoned on it the night we got home from Easter dinner. I am now 17 weeks & 3 days along with a healthy baby growing in my belly. It truly is a miracle. So that is The Big News! I am keeping two written pregnancy journals, and most of the details of my pregnancy and doctor’s appointments have gone in there, but maybe I will see this blog as a good place to record some of those things as well. I have just struggled with updating because most of what we went through was so private (and then the pregnancy was sort of a secret for the first trimester). I do, however, think it’s good to share our story and what I was feeling with other couples who may be facing similar obstacles. I am beyond thankful that we got pregnant when we did and we didn’t have to go through more complicated procedures and lots of time waiting – but I did go through many of the same emotional struggles we would have gone through had we been trying to get pregnant the entire year. I’ve also tried to really digest what it means to fully lean on the Lord, no matter the outcome. It’s hard to watch couples who love God and would be great parents struggle to get pregnant, and it’s hard to understand why. It’s hard to watch a mother go through a miscarriage. It’s even harder to trust that, in the midst of these heartbreaking circumstances, God has a plan that is bigger than we can sometimes understand. I really had to trust that if we couldn’t have children, that God had a reason that I couldn’t see, even though I desperately wanted to become a mother and I saw that as my life’s purpose. I would have struggled for a long time (possibly the rest of my life) getting along with God if He had denied me the motherhood I really, really wanted. I don’t know how I would have dealt with it, but I was prepared to go through it. I also want to mention that I am keenly (perhaps too keenly) aware that something could go wrong, that I could miscarry this baby. I know women who have had stillbirths. Even beyond delivery, I know that something could happen to our child any year of his or her life. This is what really puts my trust to the test… and reminds me that I am not God, and will never be God. I cannot protect my baby from everything, and even a mother does not love her child perfectly. God loves perfectly and deserves our full dependence… we are stewards of His child, really. And that gives me peace. To everyone praying for a baby or a child, my heart aches for you. I pray the best for you and your family, and I pray that God would be close to you. Categories: Uncategorized | Tags: Baby K., faith, fatherhood, God, infertility, motherhood, PCOS, pregnancy, trust | Permalink. In the gospel of Mark, Jesus heals the same affliction (blindness) in different ways. One person’s healing involves spit and gradual clarity, while another’s healing comes instantaneously through Jesus’s words (Mark 8:22-26, 10:46-52). “…Why the different approaches to healing? Most likely it was because Jesus’ methods were often tailor-made to the individual’s needs. Another reason why comparison is unhealthy – even (and especially) among our Christian walks. Each person is different and God uses & teaches each person differently. One is not better than the other. There’s another instance in Mark where a man who had just been healed from thousands of demons wants to follow Jesus, and Jesus tells him instead to “go home” and tell his family what God did for him (Mark 5:18-20). It may seem like being Jesus’ disciple was the more “glamorous” of the two options, but God had other plans for this healed man and his community that were just as important and meaningful. I hope God will continue to teach me this lesson because I am so guilty of comparing myself to others, and also of being hurt or offended when I sense that people don’t fully approve of my life or my decisions. I have to say, comparison can even be a problem in marriage. Dayne’s and my spiritual walks are not the same; we don’t learn the same way or grow the same way, and we’re not called to all the same things. We’re different people. For some reason, this has been more of a struggle for me to accept than for Dayne. I keep wanting us to always be on the same page, which is just impossible and a bit ridiculous. 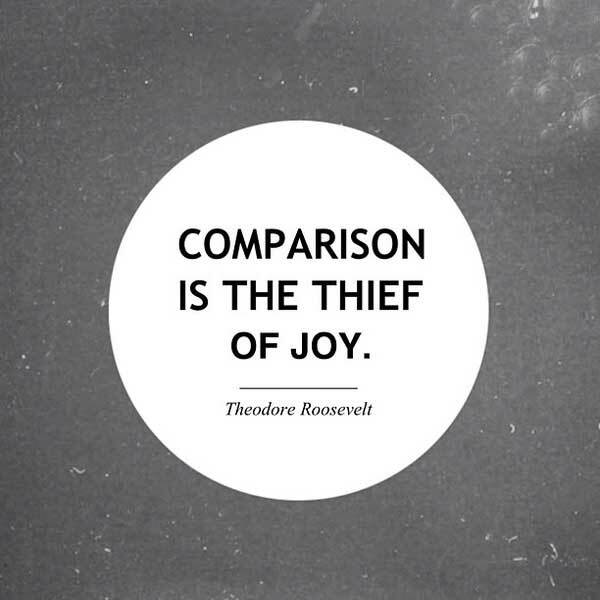 Why does comparison steal our joy? Because we were created and designed to live our lives, not anybody else’s. Categories: Bible Study, Marriage, Smart Things Other People Say, What I'm Learning... | Tags: Bible, Christianity, comparison, faith, God, healing, Jesus, joy, life, Mark, marriage, relationships, spirituality | Permalink. Walking through the Gospels is so different from walking through the rest of the Bible. Yes, I know, I just wrote a blog post stressing how Jesus is the same person as the God of the Old Testament, and the Old Testament is absolutely relevant to modern-day Christians. I still hold to what I said. In fact, I think I’m noticing how the book of Matthew is so different because I read through the entire Old Testament, and now it feels like I am getting this intensely intimate look at God in the flesh. Like I am constantly waiting to see what He will do next (! ), even though I’ve read the Gospels before. I’m reading the book of Matthew very slowly and taking it all in… in fact, I am underlining so much I think my pen will run out before I’m through. What really strikes me is not only the things that Jesus introduces that are “upside-down” to the culture of the time (esteeming women, advocating for nonviolence, hanging out with tax collectors & “sinners”, teaching a righteousness surpassing that of the Pharisees, loving your enemies, etc. ), but also the standard Jesus is calling us to if we follow Him. What does it say about me if I only hang out with people who “meet my criteria”? Why haven’t I been seeking out and giving my time to the “sick” (those who are going through difficult times, the poor, the literally sick, the addicted, people who may be different from me, etc.)? Jesus has given me something to share, and if I never seek out the people who need it, what good am I? (cf. Matthew 5:13) This is a huge challenge for me. What really stands out to me is 1) how the disciples must feel hearing this as they are about to go out on their own to preach & heal for the first time, and 2) how I’ve read the second half of that verse (about the sparrows) many times as a comforting passage, when it is really contextually about not being afraid of men (and possibly being killed for your faith) because God is your Father, knows you intimately, takes care of you, and has a plan for you, even in death. I confess that I do a poor job of acknowledging Jesus before men (and women). I have especially noticed this in the past few months when it seems like everyone and their sister is reminding me that God is in control over my health. I should be the one taking God’s Word to heart, proclaiming that God is in control over my health, and sharing what Jesus has done for me, because He is Lord. I really want to do better at not fearing men (and women), not being concerned about offending someone, and just sharing the truth. I believe in Jesus as my Savior, and I am challenged to be open about that. Wow. I think this verse really speaks for itself. I am challenged once again to look at my priorities and make sure I am not loving anyone or anything more than Christ, including my husband. I imagine this will be even harder when I have sons or daughters. I’m also challenged as I think about the strenuous way I’ve been comparing my life to those around me rather than seeking Jesus above all else. I’m talking about comparing my marriage to other marriages, my travel to others’ travels, my house to others’ houses, my car to others’ cars, my job to others’ jobs, my clothes to others’ clothes, and around and around we go. Whoever finds his life will lose it… well, it seems to me that I’ve been looking to “find my life” a little too much and not seeking the Kingdom first. This has always been a challenge for me – the tension between seeking comfort in this world vs. seeking Christ. Our American culture forcefully teaches us to seek comfort, especially in the area of material possessions. I don’t consider myself materialistic, but I can truly get caught up in this, especially as we’re trying to make our house a home. You can really go overboard in that, just like you can go overboard in trying to look or dress a certain way, etc. Not only are you seeking comfort, but you can be indulging pride and heightening standards of competition and comparison with your neighbors, friends, and families. This could all sound very morbid until you realize that God is the source of all joy. God is the foundation and author of your purpose. Nobody loves you more than He does. He desires your good, not your harm, and He has compassion on you (cf. Jeremiah 29:11, Matthew 9:36). In the midst of all these challenges, Jesus was also preaching the good news – that we can be forgiven of all of our sin and be in eternal relationship with our Maker, who is in the midst of making us perfect to His glory. Categories: Bible Study, Smart Things Other People Say, What I'm Learning... | Tags: bible study, Christianity, evangelism, faith, God, Gospels, humility, Jesus, life, love, Matthew, New Testament, salvation, service, the bible, the Daily Walk Bible | Permalink.